Delicious gluten free chicken pho is a show stopper recipe that I think you are going to love! I can’t wait to share this recipe because it is my spin on the classic Vietnamese soup. This chicken pho soup is a comfort food that even my picky eater loves. The best way to cook homemade chicken pho is by simmering it for at least 3 hours. 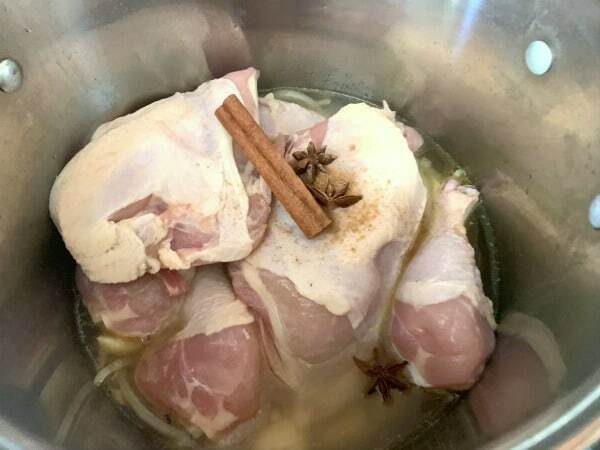 Preparing it low and slow will really allow the deep flavors from the chicken to blend with the spices and trust me, it is entirely worth it! If you love chicken soup, don’t forget to check out all of my homemade chicken soup recipes! I am sure you have figured out that I love to cook! I can’t it that I just feel at home in the kitchen. Besides, Mr. Fearless Dining and my kids never complain. When I decided to make this gluten free chicken pho recipe I wasn’t sure how it was going to turn out. Let me just say, it exceeded all of our expectations! 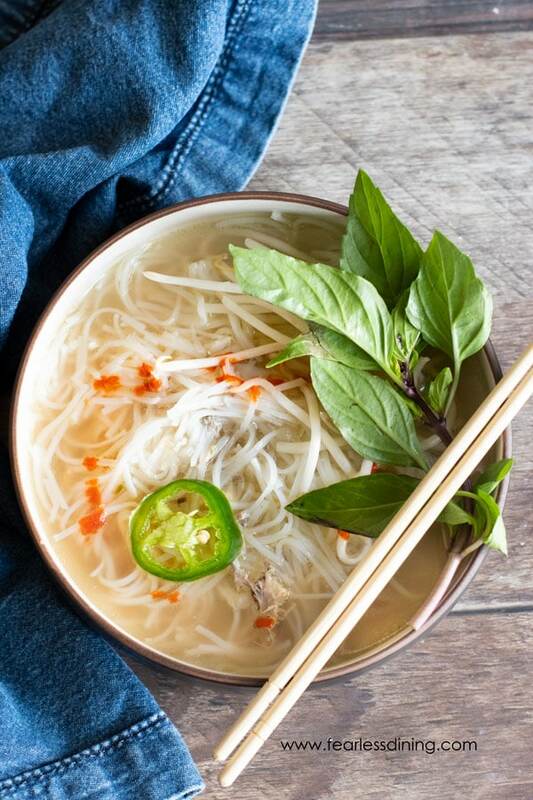 Typically, pho is naturally gluten free. Be careful though when you are eating out because sometimes it isn’t gluten free and you don’t realize it until after you ate it. When you are cooking gluten free food at home, you know exactly what is going in it and that takes away a lot of worries. I put together this guide for gluten free living to give you lots of tips. If you have never made homemade chicken pho, I am sure you will have some questions. I will do my best to answer them so you can get started making this recipe asap :-). 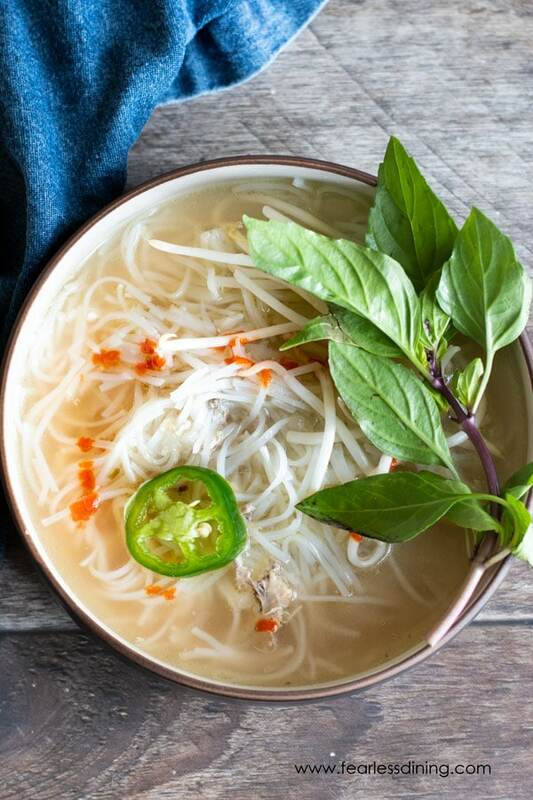 If you have never heard of chicken pho before you may not know exactly what it is. It is a Vietnamese soup that has chicken, noodles and it’s seasoned with cinnamon, star anise, and ginger. Real chicken pho is made with chicken on the bone, and slow simmered for hours so the nutrients come out of the chicken bones into the soup. It lends to a delicious flavor profile. How Long Will Gluten Free Chicken Pho Last In The Refrigerator? Typically, you can store leftover chicken pho soup for 5 days in the fridge. If you notice an odd odor or it just smells sour, then you will want to toss it out. You don’t want to eat old chicken pho broth because it could make you ill, plus it just won’t taste good. Can I Freeze Leftover Gluten Free Chicken Pho? Yes, you can freeze the chicken pho. The rice noodles don’t freeze that well, so I recommend saving the broth and chicken. Place the leftover chicken pho soup in freezer bags. Lay the bag flat, then you can move it once it is frozen to save space. The broth can be frozen for approximately 3 months. To thaw pho out, place in the refrigerator overnight or defrost on the counter. Heat it up in a saucepan with new rice noodles until it is heated properly. Can I Cook Chicken Pho In The Slow Cooker? Yes, you can cook chicken pho in the slow cooker. Follow the directions for cooking except add everything to the slow cooker instead of a saucepan. All to cook on low for 4-5 hours. The longer and slower it cooks the stronger the flavors and juices will be. 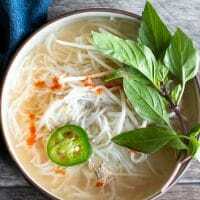 Can I Use Chicken Breasts For This Chicken Pho Recipe? Technically, you can use chicken breasts for this chicken pho recipe, but I don’t recommend it. Part of what makes this chicken pho soup so amazing is the depth of flavors because of the meld together and taste so delicious. The bone is an important part of the cooking process, so whenever possible use either a whole chicken or parts of the chicken with bones. What gluten free noodles are best in pho? The typical noodle for pho is a rice vermicelli noodle that you can find in most grocery stores. You can also use these gluten free ramen noodles for something different :-). 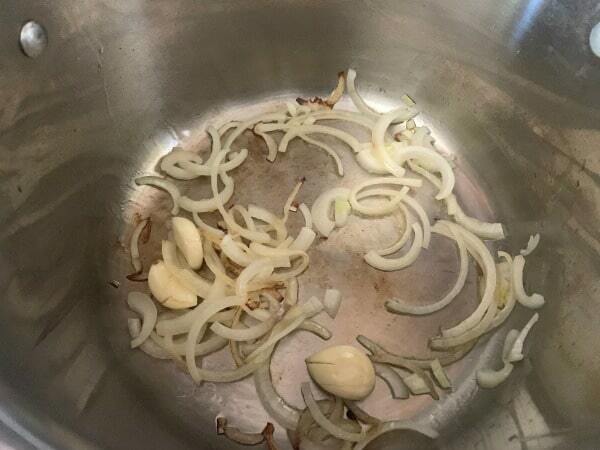 The first step is to sauté the onions and garlic in a pan. I cooked them in avocado oil as it can be used at a high heat. Add in chicken pieces and spices including star anise and cinnamon stick. Next, add the water. Do you need to use chicken with the bone? I highly recommend using a whole chicken or chicken with the bone because it adds nutrients to your soup, not to mention a lot more flavors! Cover and bring the soup to a boil, then turn the temperature to low and simmer for 3 hours. Check the soup every hour and add more liquid if needed. 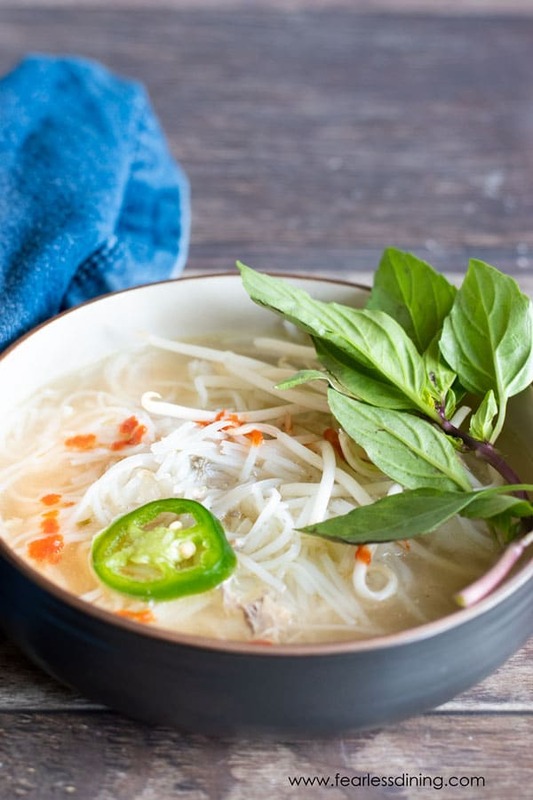 Looking for some scrumptious toppings for this chicken pho recipe? Jalapenos – Slice or dice up a jalapeno and sprinkle on top of the soup. Adds a fun little kick to the dish! Fresh Basil Leaves – You will be glad you tried it when you add fresh basil leaves because they are sweet and savory and just is so good. Sprouts – They enhance the flavor and texture of the soup. Plus, they are healthy so eat up! Lime – I think a lot of food is better when you give it a sprinkle of lime. The tanginess is incredible and pairs nicely with this dish. A delicious easy stovetop homemade chicken pho recipe. In a soup pot, add the oil and heat over medium heat one minute. Add the onion and garlic, sauté for 3 minutes. Reduce the heat to simmer and cook for 3 hours. Add more water as needed. Prepare rice noodles per package instructions. Add some cooked noodles to your bowl, add soup and chicken. Top with sprouts, basil, lime, and jalapeño. Oh, man, Sandi! I am digging all these layers of flavor! Such great instructions, too. I know mine will turn out perfectly when I follow your recipe! I am so glad you like this Pho recipe, Jenni. Thank you! We are blessed to live near some amazing Vietnamese restaurants, but markets as well. I’ve make homemade ramen, but not pho. Your broth sounds delicious! This is like comfort in a bowl! So delicious. Pho is one of our favorite go-out dishes. Glad to have found a simple recipe to be able to make it at home! I really need to try this at home. We’re big pho fans, but it’s never even occurred to me to make it ourselves. I’m totally intrigued by the spices too! My kids are huge pho eaters and that started to get expensive. Glad I was able to make a recipe that is close to restaurant flavors. This looks so delicious! Can’t wait to make it for dinner!